Fig. 1. Typical linear propagation of an Airy beam. Non-diffractive Airy beams recently attracted a great of attentions recently [1, 2]. Their unique properties led to many applications, such as curved plasma generation, particle manipulations, surface plasmon routing, electron acceleration, etc . Since the first prediction and experimental demonstration of optical Airy beams, many efforts have been made to maintain or control their self-accelerating trajectories in both linear and nonlinear media. Unfortunately, nonlinearities tend to destroy the phase of Airy beams and thus to break down the acceleration, especially under the action of a self-focusing nonlinearity. Fig. 2. Linear (Row 1) and nonlinear (Rows 2 and 3) propagation of an Airy beam under different conditions. The panels from left to right correspond to different input conditions, and from top to bottom to beam propagation under (a) linear, (b) nonlinear self-focusing, and (c) nonlinear self-defocusing conditions. In our project, we propose a scheme to control both the trajectories and the spatial spectra of nonlinear Airy beams. By altering the initial conditions via laterally shifting the cubic phase mask coded on a spatial light modulator (SLM) , we demonstrate experimentally and theoretically that a finite Airy beam can change its trajectory while maintaining its acceleration in a nonlinear photorefractive medium(see Fig. 2). Fig. 3. Spatial power spectra of Airy beams. (a-c) correspond to (a3-c3) in Fig. 2, respectively. Furthermore, the spatial spectrum reshapes dramatically during nonlinear propagation, leading to positive (or negative) spectral defects under a self-focusing (or -defocusing) nonlinearity (see Fig. 3). Such peculiar nonlinear phenomena may find applications in beam/pulse shaping as well as in laser filamentation and plasma guidance . G. A. Siviloglou and D. N. Christodoulides, “Accelerating finite energy Airy beams,” Opt. Lett. 32, 979 (2007). G. A. Siviloglou, J. Broky, A. Dogariu, and D. N. Christodoulides, “Observation of accelerating Airy Beams,” Phys. Rev. Lett. 99, 213901 (2007). Y. Hu, G. Siviloglou, P. Zhang, N. Efremidis, D. Christodoulides, and Z. Chen, “Self-accelerating Airy beams: generation, control, and applications,” in Nonlinear Photonics and Novel Optical Phenomena, Z. Chen and R. Morandotti, eds. (Springer, 2012), vol. 170, pp. 1–46. Y. Hu, P. Zhang, C. Lou, S. Huang, J. Xu, and Z. Chen, “Optimal control of the ballistic motion of Airy beams,” Opt. Lett. 35, 2260 (2010). Y. Hu, Z. 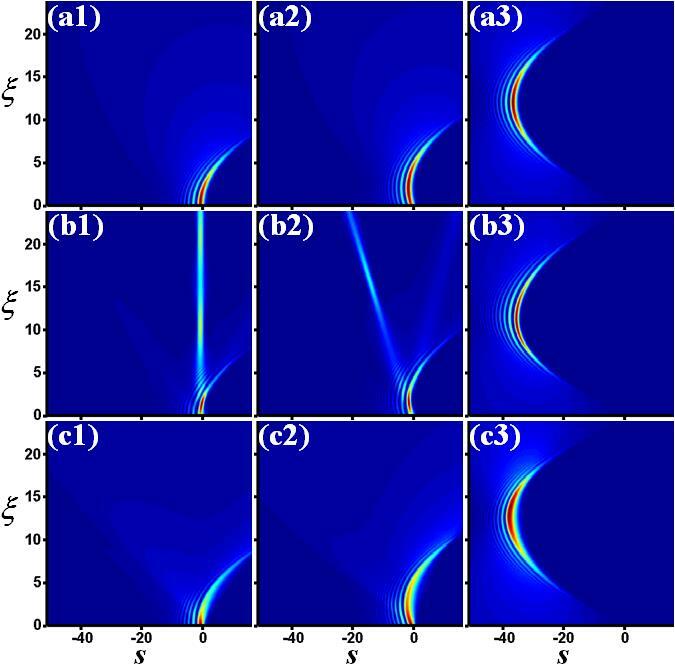 Sun, D. Bongiovanni, D. Song, C. Lou, J. Xu, Z. Chen, and R. Morandotti, “Reshaping the trajectory and spectrum of nonlinear Airy beams,” Opt. Lett. 37, 3201 (2012).